Our life is focused on looking – we rely on our eyes, we trust them. It is them who help us to acquire knowledge, to orient ourselves in the environment or to see the danger. However, the gaze also has its negative features. A look can objectify, it builds a distance. Among us, there are also people whose perception is completely different – people without sight. Have you ever wondered, how one lives in a world that can be only known by hearing? Try to work with your eyes closed for an hour and you will understand that everything looks different than you thought. We do not think about it on a daily basis, but we create a world where seeing is a form of privilege. Therefore, being blind means at the same time being invisible. It is time to challenge the gaze and to ask: are you sure that your eyes are not closed? 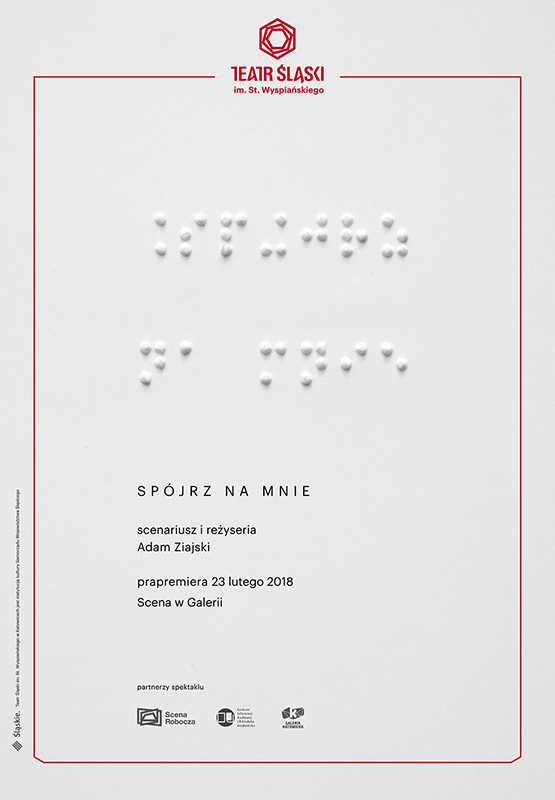 Adam Ziajski, the legendary Polish off-theater artist, for the first time worked in the institutional theater. He decided to dedicate his "debut" spectacle to the experience of blindness. For several months he conducted interviews with visually impaired and blind people. From among them, he chose the heroes of the spectacle, a theater reportage, who will perform on stage with the actors of the Silesian Theater. They will try to present on the stage a world that cannot be seen. The scenario of the performance was based on interviews with the heroes. Note: stroboscopic lights are used in the performance. The number of seats for spectators is strictly limited by the number of headphones for audio description. The performance is each time played with audio description.